The most important person who needs to learn from shop floor experiments is the top executive visiting with the sensei. There are millions of manufacturing and processing businesses around the world. The shop floor is an integral part of those businesses where the real action takes place. A shop floor is responsible to bring out the tangible, usable and superior quality products as per the specifications. What is a Shop Floor? Shop floor is the place where design specifications are referred, machinery and manufacturing equipment are employed for production, parts are assembled or some raw material is processed. The shop floor is responsible to produce an intermediate or a final product. Material − This is either a man-made material or a natural resource. Material is a vital part which is used to make or develop some product. Machinery, Equipment and Tools − Depending on the sector of production, there are various mechanical, electrical, electronic and thermal equipment along with various tools used on the shop floor. This factor speeds up the production and improves productivity of the business. Information Technology − Today’s shop floors are equipped with Shop Floor Control Systems (SFC), Manufacturing Execution Systems (MES), Manufacturing Operations Management (MOM) Software, Quality Management Software (QMS), Real Time Data Retrieval from shop floor operations, and other such simulators. Quality Control − When the product is ready, it is required to undergo certain quality tests and criteria to meet customer satisfaction. The Quality Control Section of a shop floor ensures that the product is flawless and up to the customer’s satisfaction. Store Room − It stores spare parts and other such inventories. If there is an appropriate store room layout, its management is shrewd and there are proper SOPs in place, it will certainly reduce operational costs to quite an extent. An up-to-date store helps to predict the budget accurately. Staff − Skilled and experienced staff is a great contributor to successful production on the shop floor. Such staff can work with minimal errors and maximum perfection. What is Shop Floor Management? Shop floor management is developing and managing the shop floor operations, inventory, equipment and workers. 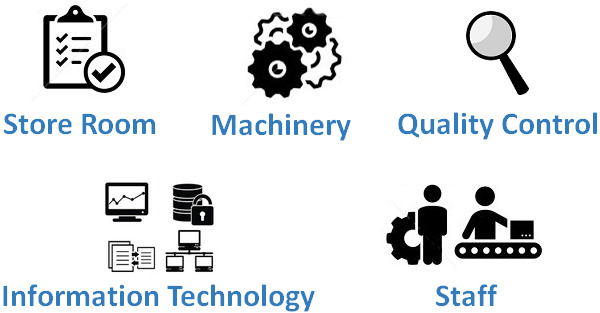 The following diagram displays the general phases of a manufacturing/processing/assembly business. A shop floor being the participant of a production phase, its management requires dealing and handling all those factors which are directly involved in production. Genba (Real Place) − It refers to the location where the value is created. It can be either the factory floor or a business process. Genbutsu (Real Thing) − The realistic information of all the problems rather than the documented information. Genjitsu (Fact) − Mapping of current problems and their root causes with the help of valid and consistent data. Thus, Suzaki claims that shop floor management is a closed loop process to monitor the problems onsite as well as to find out and remove their underlying root causes. Routing movement of material on shop floor appropriately. Sequencing the procedures and processes taking place on shop floor. Scheduling of workforce, resources and operations. Finding deviation from standard procedures and processes. Identifying loopholes in shop floor communication. Increased operational efficiency through standardization of operations. Reduction in occurrence of errors in work. Revealing of loopholes in production or processes. Increases productivity of the staff. Positive impact on the revenue of a manufacturing business. The quantity of goods produced at one time. It is automation of machine tools, which operate by precise programmed commands in contrast to manual control by hand wheels or levers. Being on a clear path but choosing a wrong entrance to be on that path. It is same as lean manufacturing. A Japanese inventory control system to control supply chain. It is a business philosophy that means executing things as simply and cheaply as possible while providing best quality and fast service. Manufacturing by increased efficiency and productivity, and decreasing waste. It is a communication tool in the form of red colored paper tags. It is used to identify items that a shop floor person has tagged for removal from the work area. It is the list of goods and material a shop floor holds for repair, resale, manufacturing, assembling, or processing for a length of time. It is something that adds no value. The manufacturing waste due to overproduction, over processing, defects, unengaged employees, waiting time, transportation, inventory, and motion.